You may not know this if you're a "Newtheran" (although I'm willing to bet that most of my astute readers are already keenly aware of this), but October is a very special month within Christ's Church, and particularly within the Lutheran church. "Clergy Appreciation Day" is always the second Sunday in October (this year it's October 11th, 2015) and October is generally celebrated as "Pastor Appreciation Month" (universally throughout Christ's Church regardless of denomination). In addition, October 31st is also when we Lutherans celebrate "Reformation Day" too. With that in mind, please take some time to thank your Pastor and to meditate upon God's work through Martin Luther on that very first Reformation Day nearly 500 years ago. Better yet, do that and talk about it with your children and grandchildren too! To help, here's an excellent free resource that Concordia Publishing House (CPH) put out recently that you and your family can use to "appreciate" the faithful Pastor that God has given you. Trust me, they are quickly becoming few-and-far-between I'm afraid (me and my family sadly know this from first-hand, personal and recent experience!). You might be thinking, "Why in the world should I thank my Pastor for...doing his job!?!" My dear friends, being a called and ordained minister of God's Word and Sacraments, and servant of Christ Jesus, is not "just a job" like any other! Pastors are called by God Himself to be the caretakers of our souls. Perhaps this brief video will help to give you a better understanding of why Pastors need our constant prayers and support and not just one day day or during one month of the year. That was a behind-the-scenes look at a day in the life of just one Pastor. Folks, there are many more just like him. Again, please take a moment to thank God for your Pastor, and then go back and check out CPH's calendar shared above for ideas on how you can encourage him. Seriously, don't take this (or him) for granted! My family and I searched far and wide throughout the local area and it took us nearly 2.5 years to find a truly faithful Pastor who is trying to do the right things at the church the Lord has entrusted to his care (i.e., preach Law and Gospel; teach the Book of Concord to his parishioners; etc.) despite finding himself in a situation that may not be all that conducive to such things. When you've gone as long as we had without hearing the Word of God preached faithfully and without the Sacraments being distributed rightfully, you really come to appreciate it when the Lord blesses you with a man that does what He expects him to do. Now, just as important as a faithful Pastor is faithful catechism. So, since October is also when we Lutherans celebrate the Reformation, we should spend extra time making sure we not only teach, but reinforce the basics. 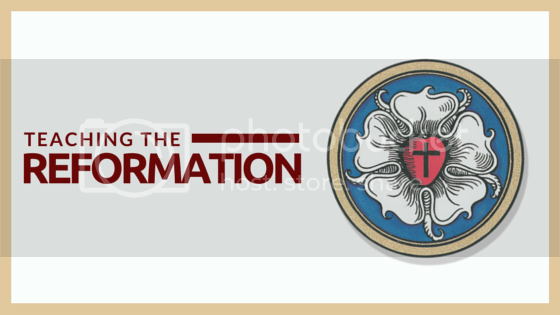 Those are some very easy (and fun) things you can do at school and at home to help teach your students and your family about the Reformation. In a Lutheran layman's terms, not only is the Reformation "the cornerstone of our Lutheran faith" but Pastors are truly "'on call' 24 hours a day, seven days a week" and we need to regularly thank God for both.